The Pantheon that exists today is the third recreation of the structure to which many historical articles offer various theories on how and why it was built. Legend claims that the original Pantheon was built on the same site where the current one still stands in the Campo Marzo – modern Rome’s business district. The ancient Roman’s planned the construction of the first Pantheon where Romulus, the founder of Rome according to Roman mythology, ascends to heaven sometime between 753-715 B.C. Dedicated to Romulus’ passing and his divine ancestors, the Pantheon was used for centuries to host rites and processions to Rome’s original Pantheon of Gods that included Jupiter, Juno, Minerva, Saturn, Mars, etc. (753-716 BC). Between the period of 193-217 A.D. the Pantheon was maintained and restored by the Emperors Septimus Severus and Caracalla. During its two centuries as a functioning temple, polytheism was practiced. Statues of Ancient Roman gods filled the niches and animals were sacrificed and burned in the center, the smoke escaping from where the light poured in through the oculus. The design of the Pantheon is ‍based on classical architecture‍. A simple, yet elegant style, classical architecture incorporates clean lines and subtle accents in the form of metal decorations or carvings. Classical architecture was often built on a grand scale, with imposing columns and large arches and domes to demonstrate the skills of the builders. The Pantheon that exists today is composed of a rectangular portico with three lines of granite columns fronting a circular building designed as a huge hemispherical dome that is 43.3 meters in diameter (Figure 6). Note that a portico is by definition, an entrance of a building supported by columns or enclosed by walls. 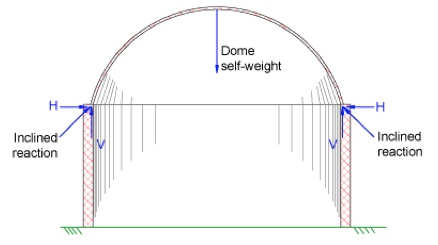 The dome is built over a cylindrical structure of the same diameter and of a height that has the dimension of the dome’s radius at 21.65 meters (Fig. 7). An interesting observation to make while at the Pantheon is that the rotunda’s internal geometry creates a perfect sphere. The height of the rotunda to the top of its dome matches its diameter. Emperor Publius Aelius Traianus Hadrianus Augustus, recognized in history under the name Hadrian, is credited with the basic plan and unique architectural design of the Pantheon. Apart from ‍being the architect of the Pantheon and many other structures during his reign‍, Hadrian was the adopted son and successor of Emperor Trajan. He was known to his peers as “the Greekling,” and held an avid interest in Hellenic culture especially in the field of literature, music, and architecture. By 120 A.D., Hadrian began designing a Pantheon to resemble the Greek temples and follow the design of Classical architecture. Unique for its time period, it was far more elaborate than anything Rome had yet to see. His plans called for a structure with three main components: a portico, a circular domed rotunda or vault, cupola and a connection between the two. According to an interpretation of Hadrian’s will for the Pantheon, his intention was to build a sanctuary for all All Gods- that the Pantheon would be built in the likeness of the terrestrial globe and of the stellar sphere. To create this Pantheon, he designed an oculus (Figure 8.) into the cupola to reveal the sky through a great hole at the center- making this temple feel both open and mysteriously enclosed. He envisioned prayers to rise like smoke toward that void and onward to the place of the gods. Among the many buildings influenced by the Pantheon’s design are the ‍Low Library at Columbia University, British Museum Reading Room, Thomas Jefferson’s Rotunda at the University of Virginia, and the State Library of Victoria in Melbourne, Australia‍. Current buildings aside, structures like St. Peter’s Basilica and Bernini’s Baldachin are also influenced by the Pantheon’s architectural grace. It is written that in the 16th century, Michelangelo came to study the Pantheon before he began work on the dome of St. Peter’s Basilica. (‍Figure ‍9.) 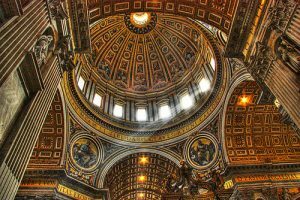 When he first saw the Pantheon in the early 1500s, he proclaimed it of “angelic and not human design.” Inspired by the dome of the Pantheon to create St. Peter’s, he created his dome of which it is two feet smaller in diameter, but similar in style. The Pantheon’s composition of materials has changed over time. ‍Structurally, it remains the product of Hadrian’s engineers‍; aesthetically, the elements of its design have changed and passed on to other structures. 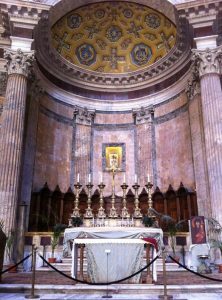 Just after the fall of Rome to the Visigoths, the pantheon’s role as ancient temple ended and it was converted into the church of Santa Maria and Martyrs. During this time period, the Visigoths let it be and the locals didn’t use it as a quarry. It was not until 667 A.D. that the Pantheon’s original decorum was taken away. Repurposed for Bernini’s Baldachino, the Pantheon was stripped of bronze roof tiles and looted of anything of value. The building was partially restored by Pope Benedict II between 684-685 A.D. Yet it was robbed and restored several times thereafter. The Pantheon’s design can be described to be in the likeness of a large barrel with a dome covering the top. Layers of red brickwork cover the outside rounded walls of the rotunda supporting the dome. Small access holes can be observed occasionally along the wall and were mostly likely used during construction to frame interior voids. The main entrance is thoroughly impressive: double bronze doors, which were returned and restored recently in 1563, are 21 feet high (6.4 meters). These doors are at the end of a rectangular portico, held up by sixteen granite Corinthian columns from Egypt that also support a gable styled roof. The beams in the roof structure of the porch are wooden. They were substituted for bronze members stripped-out by those in later years for reuse in other metal crafts. Professional Roman surveyors located the inlaid marble floor to conform to a convex contour, which drained away the rain from the oculus for hundreds of years. The Pantheon is a marvel of construction ingenuity- the result of a century of experimentation with the use of advanced building elements such as the relieving arch, vaulting rib, lightweight caementa, and step rings. What is particularly unique to the Pantheon however is the method by which these elements were incorporated into a structural system that has allowed the largest unreinforced concrete dome ever built to stand for almost two millennia. Until the 20th century, the Pantheon was the largest concrete structure in the world. And it remains the world’s largest unreinforced concrete dome. An engineering marvel, the dome’s components are a tribute to the creativity of the design. For example, the oculus (otherwise known as the “open eye”) serves to reduce loading at the top. Otherwise, the dome still stands at 142 feet high and wide under a circular rotunda for additional reasons. According to the analysis of Filippo Brunelleschi, an engineer and architect of 1377, a material sample taken from the Pantheon’s dome, to the right of the entrance, shows that the concrete composition of the structure was non-homogenous. (Figure 10.) The construction technique applied to the dome involved applying thinner and lighter concrete at greater heights- the highest part incorporating volcanic pumice as aggregate. The Pantheon today is situated on the foundation prepared by Hadrian’s engineers. It sits in a circular trench 26 feet (8 meters) in diameter and 15 feet (4.5 meters) deep for the rotunda’s foundation and rectangular trenches for the portico and the connector. The trenches are lined with timber forms and held together with pozzolana cement – a powerful Roman cement created by the combination of grounded lime and a volcanic earth abundant Italy. Initiating the building process was challenging and similar to modern day building processes, work was executed in gradual stages for concrete placing and construction workers needed to be acutely aware of their surroundings given existing buildings and communities. An additional construction challenge that the Roman’s faced was the lack of machinery. Vitruvius, a Roman architect and engineer, outlined the process used by the Pantheon’s builders by which they worked without modern technology. Through his accounts, we know that the ancients hand mixed wet lime and volcanic ash in a mortar box with little water so that they produced a low water to cement ratio and dry concrete composition. They transported this mixture to the jobsite via baskets and poured it over a prepared layer of rock pieces- tamping the mortar into the layers of rock. The tamping packed the mortar, reducing the need for excess water; but at the same time, it stimulated bonding as it pushed aggregate in the concrete into the mix. 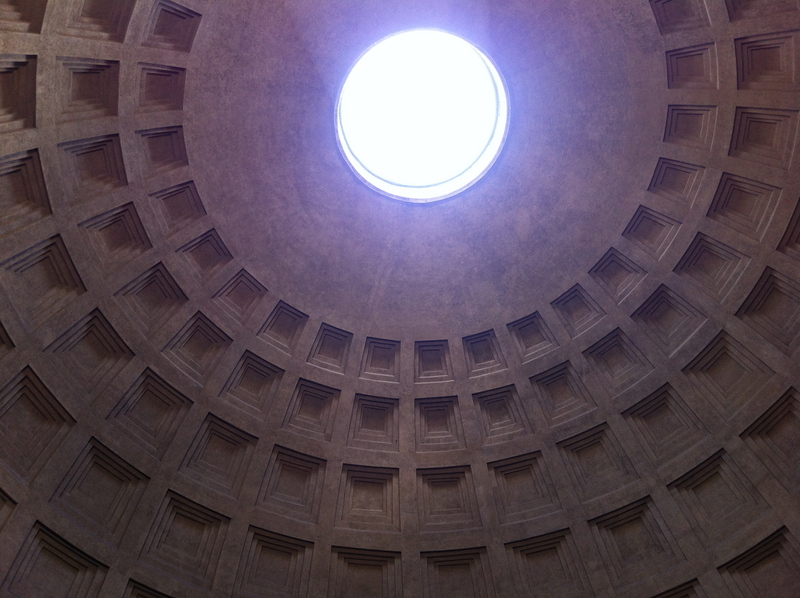 To create the dome’s oculus, which acts as a compression ring for the Pantheon, the Romans built two circles of bipedales. A characteristic of all Roman walls of the time, the walls were tied together with bonding courses made of tile-like bricks called bipedales which extended completely through the wall. Brickwork on both sides of the wall was brought up with the placement of the concrete. They laid the bipedales edgewise in three vertical courses, then circled the oculus with a bronze frame. For whatever the reason, the Pantheon is the only structure of its age, size and span that has successfully survived the scourge of time and gravity and has remained pristine in splendor and beauty. While the Pantheon may be divinely protected, there are more earthbound reasons for its survival as well. We can attribute its ‍longetivity ‍to the quality of materials used. Perhaps it is because of very strong concrete with pozzolona cement that we are able to too can marvel at the wonder that Michelangelo once described to look more like the work of angels, not humans. Structural analysis is the possibility of predicting the bearing capacities of elements before the construction of the building itself. It is a practice that had only begun to be systematically developed during the 19th century and was unavailable during the time the Roman’s were constructing their structures. During the Roman era, design and construction were based solely off the observation of failures. It allowed the structural engineers of the time to single out favorable shapes and proportions to maintain structural integrity. The evolution of structures can roughly be seen primarily as a form of continuous research to combine or mix structural forms. These mixtures of structural forms vary on materials and facilities available: i.e. structures with a supporting function: pillars, columns, and walls; structures with a spanning function: beams, arches, ropes, plates, shells, vaults, and domes. This is where the Romans had an advantage over other civilizations- they were capable of creating an empire so vast that they had the materials to support their intended construction efforts with applicable methods. An arch is a structure that is usually made of stone, brick, concrete, or steel. (Figure 13.) Featuring curved contour, it is design to support or strengthen a structural design via its ability to distribute load. 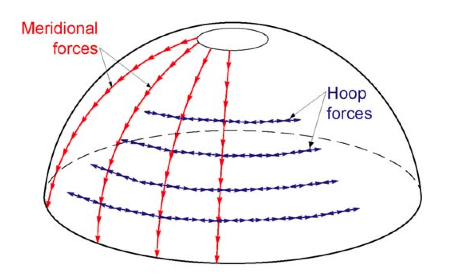 As in most curved elements, the couple produced by the internal stresses associated with the horizontal boundary reaction creates the bearing capacity in an arch. The arch can be classified as a construction technique where the elements of the structure themselves are in compression instead of tension in the material; thrust instead of pull at the abutments. Most arches are built of ‍wedge-shaped blocks‍– the top center stone is known as the keystone and is the final block to be inserted when assembling an arch. During construction, wooden scaffolding often supports arches prior to the removal of the frame. The finished product results in two arms of masonry arches press against a keystone to create a stable structure in which the moment produced by the two arms of masonry are canceled out. It is noted in history that the Romans did not invent the arch but they were able to utilize it in many innovative ways to create engineered structures. In fact, arches have been used since prehistoric times- the ancient Egyptians, Babylonians, and Greeks all used it in their structural designs. However, within those particular civilizations, the potential of the arch in these cultures was never fully discovered and the extent of its use was is limited to supporting small structures, such as storerooms. Yet the ancient Romans did in fact discover something unique to their time that helped them to uncover the capabilities of the standard arch. In order to support huge amounts of load- they discovered how to produce a strong building material using the combination of cementatious materials and aggregate. ‍In other words, they discovered concrete using a mixture that included lime and volcanic ash. The Romans created a very strong and durable type of concrete and arches made of this substance could support a considerable amount of weight. As a result, Romans were able to design and construct massive structural supports and elements within the Pantheo‍n. The ‍purpose ‍of the arches in the Pantheon are less obvious than at the Coliseum, but it can be presumed that they were probably used in the wall as means of consolidating the materials in construction and controlling settlement as the concrete cured so that the construction of the Pantheon’s outer walls could proceed upward quickly without a great lag time between stories. Thus, it is easy to see the traces of the Pantheon’s outer walls are lines with arches within the masonry, testaments to the effectiveness of the arch as a shape that can bear loading and redistribute it into the foundation if properly aligned in the vertical direction as shown in Figure 14. In other words, relieving arches direct the loads to the thicker parts of the wall between the niches. They provide a structural component to the wall that helps prevent excessive creep or settlement in any one place within the wall. 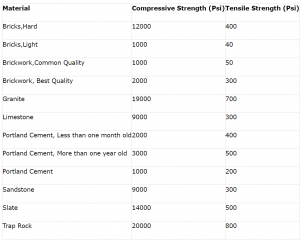 Note that the distinguishable characteristics of concrete, ancient or modern, are that it gains strength slowly over a period of time and that it is susceptible to the phenomenon known as creep, which is the slow deformation of the material over time. 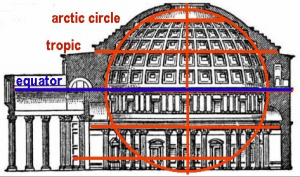 At the base of a dome, the support structure of the rotunda must resist the inclined loads from the dome with equal and opposite reactions to create static equilibrium (Fig. 5). The support structure typically resists the vertical component of the inclined force with ease as forces along the y-axis can be ultimately be transferred into the ground. 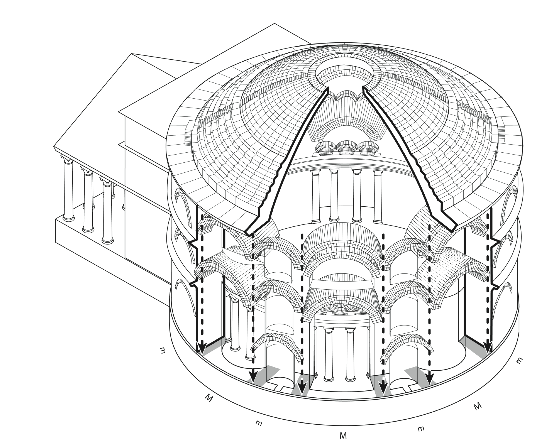 However, the dome and support structure of the rotunda must also resist the horizontal component- the outward thrust being the greatest near the base of the dome. 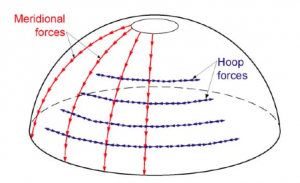 External means of structural reinforcing may be used to counter the thrust created by a dome. 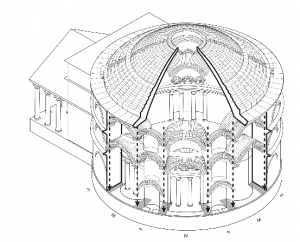 In the case of the Pantheon, the engineering of the structure requires massive structural walls for support as it was not yet conceived to apply a tension ring about the perimeter of each of the dome’s rings. 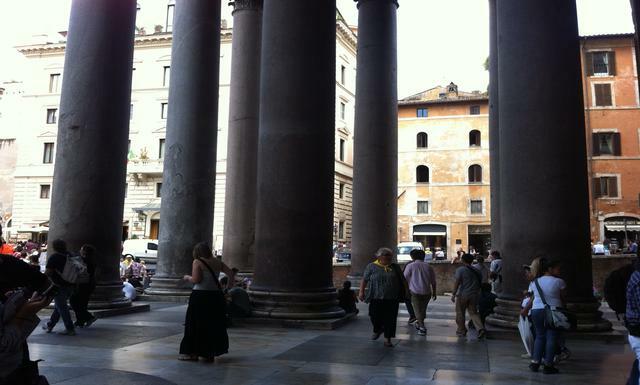 Enter into the portico of the Pantheon and you will walk among 16 towering, grey granite columns. Standing at 39 feet (11.8 meters) tall and five feet (1.5 meters) in diameter, each column weighs 60 tons and supports additional loading from the roof structure above. Inside, you will see a series of many more columns in colors of red, grey, and crème in various sizes and designs. A column is an upright beam and a linear element- the bearing capacity is mainly provided by bending moment action, that is the couple produced by the tensile and compressive stresses at opposite edges of the same section of the beam multiplied by the moment arm/ distance measured between the point where forces are applied and the point that is pinned. Columns are composed of three main sections. The base. Most columns rest on a round or square base. The shaft. The length of the column. It may be smooth, fluted or feature carved designs. The capital. The top of the column may be simple or elaborately designed- it is usually with careful observation of the capital that a column can be classified as Doric, Ionic, or Corinthian. Of the three column designs, Doric columns are the simplest. Their capitals are made of a circle topped by a square. The shaft is simple, featuring 20 straight sides or a smooth surface that end at a simplistic base that is not a capital. Ionic shafts are generally taller than those on Doric columns. They also featured flutes, which are grooved patterns carved into them from top to bottom. Columns of the Ionic style look more slender and appear perfectly straight due to entasis– the application of curvature that make the column look straight at a distance. Ionic capitals are designed to look like scrolls above the shaft. The Corinthian order is the most decorative of the three styles. Corinthian also uses the method of entasis to make the shafts appear straight to the human eye. The Corinthian capitals have flowers and leaves below a small scroll that connect to the shaft and end on a circular or square platform that is the base. All columns of the Pantheon are of this style. The term foundation refers to the soil material under the structure as well as any engineered load-carrying member. Through load paths, building loads such as self-weight are transmitted by columns, bearing walls, and other bearing members to a structure’s foundation. As the foundation is the lowest part of a structure, it serves to transmit loads to the underlying soil material without causing a shear failure of soil or excessive settlement. Foundation design is the responsibility of a Structural Engineer. Completion of a foundation design is a specialty that requires analysis to be done on multiple components that need to be incorporated into the design. One such component of foundation design is foundation depth; and the required depth of the foundation depends on several factors such as soil bearing capacity, soil type, depth of frost penetration in the case of fine sand and silt, height of the ground water table, and the minimum depth. The material used to create a structure’s foundation includes brickwork, masonry, and/or concrete. Positioned under the base of a wall or column, it serves to transfer loads into the soil in a uniform manner and is designed to transition a structural design into the soil. It is optimal to situate a structure on dry and uniform graded dense materials to achieve maximum shear resistance and maximum bearing capacity. 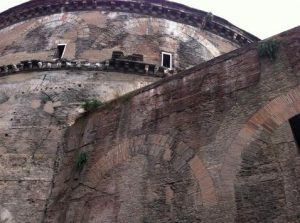 It is not advised however to situate a structure on submerged soil or clay as it has fewer bearing capacities, which reduces the capacity to handle loads imposed by the structure to which the Roman engineers of the Pantheon made a poor design decision to do. Analysis of the site has determined that the Pantheon stands not on rock but on clay. Drawings published by the Italian Mathematician and Physicist Beltrami in 1898 show that the Agrippan structure under the portico slopes towards the south. An additional survey indicates that the existing floor level drop by almost 40 centimeters from the front of the portico to the main apse and may be the result of settlement due to the great weight of the rotunda. It is also notable that the Pantheon has sunken below current street level, which shows that the city has risen on 20 centuries of rubble. The foundation should be designed in a way that structural loads are transferred uniformly to the contact surface beneath it. Well-designed foundations are designed to transmit the sum of dead load, live load, and wind load into the ground and soil below to which the net loading capacity imposed onto the soil should not exceed the bearing capacity of the soil. Additionally, settlements over time should be expected from the building and the foundation design should be accounting for concerns involving “how” to control settling and create uniformity for the complete structure in order to avoid future damages to structural elements. It is advisable that the design of the foundation and super structure account for the characteristics of the ground and survey the building’s environment to obtain quality assurance on the soil capabilities prior to construction work. There are several types of foundation used in the construction industry. As is the Pantheon’s foundation, the foundation mainly used is called mat foundation. A mat foundation is a uniform slab acting as the footing for the building and is thought to be the most secure because there is no gap to allow for differential settlements as it will act as a mat for the whole building. Sometimes due to economic reasons, types of buildings, and space limitations substitutions are made to utilize other types of foundation. Taking a personal reflection back into my past, I remember that as an engineering student it is most likely a forgone conclusion that studying abroad is not an option unless a year of studies is forfeited. 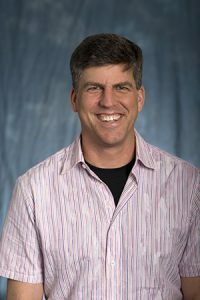 I was extremely lucky when I happened upon the program Engineering Rome via the suggestion of a close friend to look up study abroad opportunities at the University of Washington. Never again will I need to explain that: “I couldn’t find a study abroad to fit into the time I have in college.” And for that I am grateful because my experience in Rome was amazing; and I fell in love with everything I encountered while on my trip. I’m a structures geek. And it came to no surprise to me that when I set eyes on my first ancient Roman structure, it would be breathtaking. 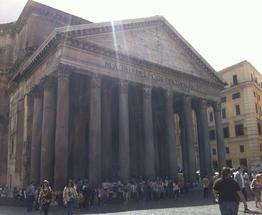 Lo and behold, my first on-site encounter with the ancient civilization was with the Pantheon. (Figure 17) Thus after some time debating and reconsidering my initial intention to write about masonry, I researched and wrote my report on the Pantheon- aiming to accomplish a structural analysis and learn more/write about its history as an architectural piece and a construction marvel. 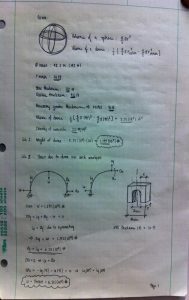 I fell short of doing a comprehensive structural analysis as I am but an entering junior in the college of civil engineering. And until the day I can run 3D analysis on the dome and take into account the various layers of concrete applied at different depths and with different aggregate components, I can only compile a sudo-calculation run. 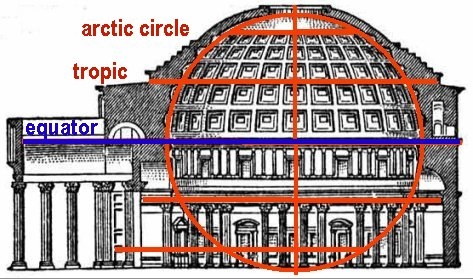 Using the theoretical self-weight of the dome in my calculations, I can find the thrust it applies to the rotunda structure below via arch analysis; starting by taking the dome’s self weight to be the displaced weight by an arch at the top. 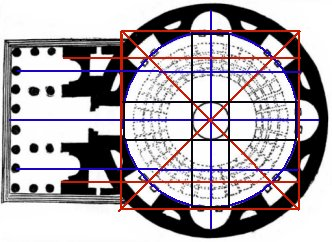 This method models the arch after the cross section of the Pantheon where the dimensions of the arch are based on the rotunda’s architectural relation to the dome, its diameter equal to that of the dome’s diameter. Using arch analysis, I can assume the thrust that the structure places on the rotunda below it using methods of Newton’s second law analysis, free body diagrams, and the concept of static equilibrium. This thrust is calculated to be 1/2 of the self weight of the dome at 6.215(107) # (Figure 18). Therefore, my extremely fundamental knowledge of structures and my pseudo-structural analysis concludes that the Pantheon’s rotunda cannot withstand the weight and thrust that the dome creates. And apart from the assumption that heavenly forces must be present, it is more accurate to conclude that I will need to revisit my methods in the future to incorporate several key factors that contribute to the fact that the structure’s presence proves my calculations incorrect. Key factors such as the method of building the dome in consecutively lighter layers, the creation of the oculus, thicker, studier materials in the rotunda walls, and so on. (1) Croci, Giorgio. The Conservation and Structural Restoration of Architectural Heritage. Billerica, MA: Computational Mechanics Inc., 1998. 1-2. Print. (2 Jones, Mark Wilson. “The Pantheon and the Phasing of its.” n.page. Print. (3) Lancaster, Lynne C. “Materials and Construction of the Pantheon in Relation to the Developments in Vaulting in Antiquity.” n. page. Print. (4) Martines, Giangiacomo. “The Structure of the Dome.” n. page. Print. (5) Hannah, Robert. 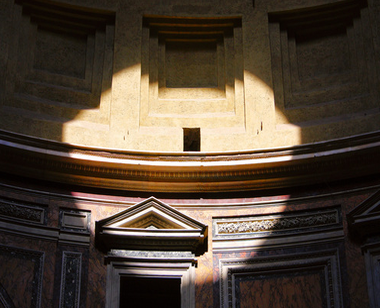 “The Role of the Sun in the Pantheon’s Design and Meaning.” n. page. Print. (6) Steve, Rick. “Sights in Rome-Pantheon .” Italy. n. page. Print. (7) Lau, Wanda. EQUILIBRIUM ANALYSIS OF MASONRY DOMES. Massachusetts Institute of Technology: Print. (8) MacDonald, William . 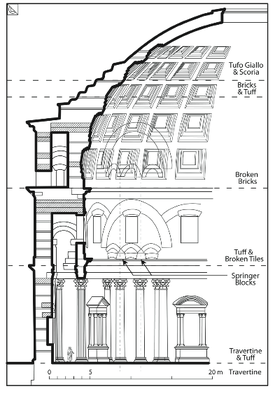 The Architecture of the Roman Empire. 1986. 110. Print. 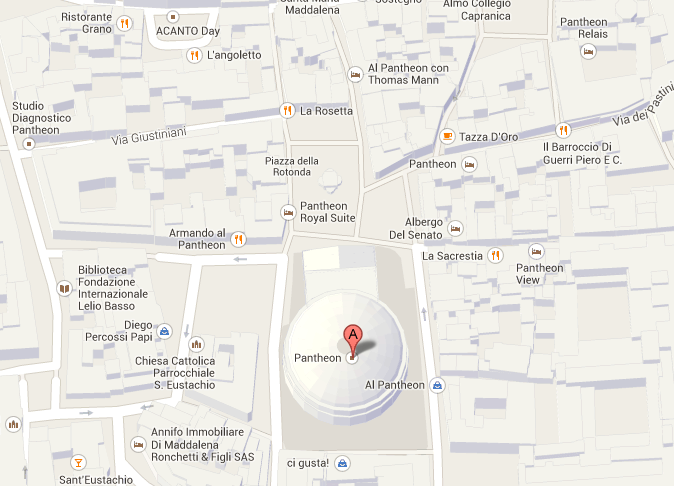 (9) “Roman Pantheon.” http://www.rome.info/pantheon/. N.p.. Web. 7 Sep 2013. (10) “Ancient History.” Curiosity.com. N.p.. Web. 16 Sep 2013. <http://curiosity.discovery.com/question/who-built-the-pantheon>. (11) “Pantheon, Rome.” Sacred Destinations. N.p.. Web. 16 Sep 2013. 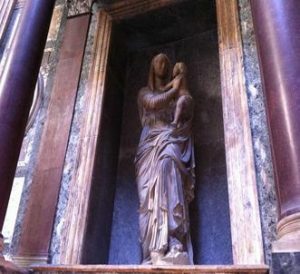 <http://www.sacred-destinations.com/italy/rome-pantheon>. 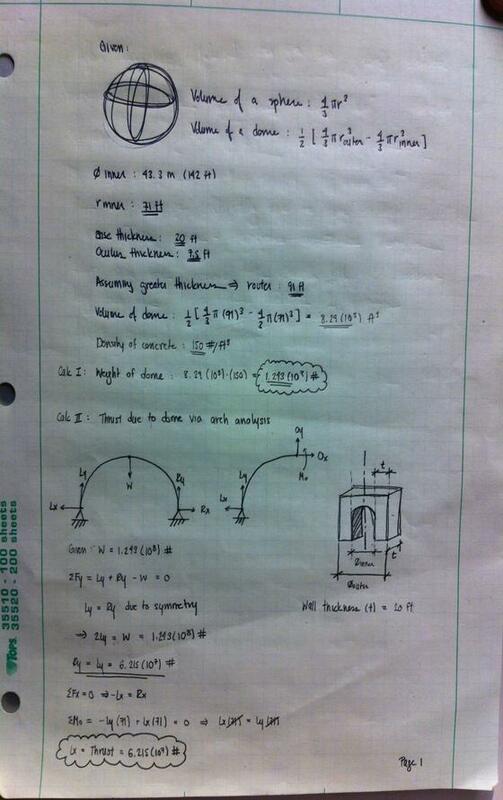 (12) “History of Structural Engineering: The Pantheon.”Alecks Associated, Ltd.. N.p.. Web. 16 Sep 2013. <http://www.aleckassociates.co.uk/structural-engineering/history-of-structural-engineering-the-pantheon/>. (13) “Classical Architecture.” Architechno. N.p.. Web. 16 Sep 2013. <http://architecturaltechnologies.blogspot.it/2009/01/classical-architecture.html>. 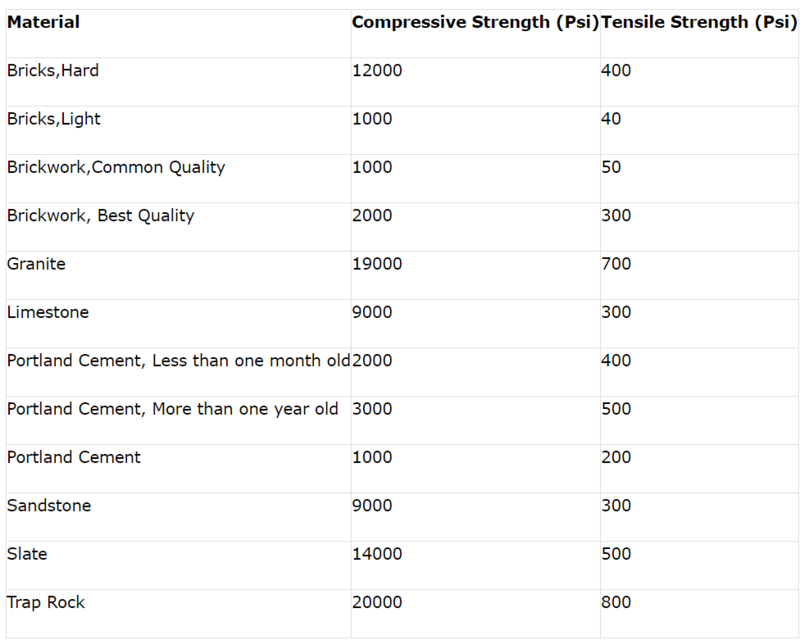 (14) “Compression and Tension Strength of some common Materials.” The Engineer’s Toolbox. N.p.. Web. 16 Sep 2013. 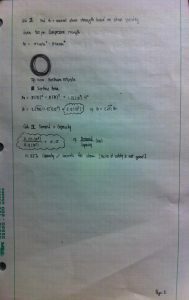 <http://www.engineeringtoolbox.com/compression-tension-strength-d_1352.html>. (15) “The Pantheon and the Phasing of its Construction.”ROMANCONCRETE · COM. N.p.. Web. 16 Sep 2013. <http://www.romanconcrete.com/docs/chapt01/chapt01.htm>. (16) “Monolithic.” The Pantheon – Rome – 126 AD. N.p.. Web. 16 Sep 2013. 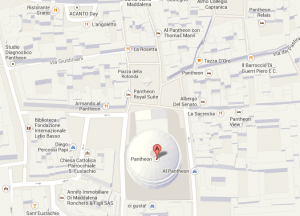 <http://www.monolithic.com/stories/the-pantheon-rome-126-ad >. (17) “6 Surprising Facts About the Pantheon in Rome.” The Walks of Italy . N.p.. Web. 16 Sep 2013. <http://www.walksofitaly.com/blog/rome/pantheon-facts>. (18) “THE DOME OF THE PANTHEON.” N.p.. Web. 16 Sep 2013. <http://harvey.ro/THE_DOME_OF_THE_PANTHEON.html >. 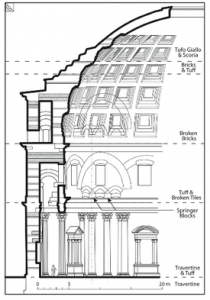 (19) “Historic Landmarks Commission.” Classical Orders of Architecture. N.p.. Web. 16 Sep 2013. <http://www.cmhpf.org/kids/dictionary/classicalorders.html >. (20) “Foundation Design.” Foundation Design. N.p.. Web. 16 Sep 2013. <http://construction.about.com/od/Construction-Design/a/Foundation-Design.htm>. (21) “Bearing Capacity .” ops.man.edu. N.p.. Web. 16 Sep 2013. <http://osp.mans.edu.eg/sfoundation/bearing.htm>. (22) N.d. Photograph. n.p. Web. 08 Sep 2013. <http://dcsymbols.com/lodgefloor/lodgefloor2.htm>. (23) xN.d. Photograph. n.p. Web. 14 Sep 2013. 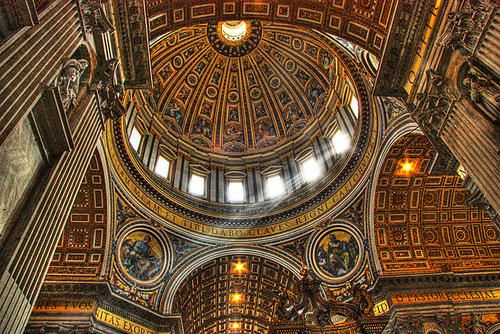 <http://www.dreamstime.com/royalty-free-stock-photos-vatican-inside-michelangelo-s-dome-rome-image10010578>. (24) Schwenkler, John. Rome.. N.d. Photograph. n.p. Web. 15 Sep 2013. <www.panoramio.com>. (25) Muench, Steve, dir. Raining in the Pantheon . Film. 19 Sep 2013. <http://www.youtube.com/watch?v=7SayvYpQxBY&feature=youtu.be>. (26) Muench, Steve. Sharypic- Colosseum Visit . N.d. Photograph. n.p. Web. 21 Sep 2013. ← How Would Aristotle Choose to Unfriend Someone on Facebook?